TravelsinTaste.com scoured the Upper East Side of Manhattan for those local gems that one can only find in neighborhood enclaves -- those unique, one-of-a-kind restaurants where you feel like you're part of the family and still get five-star service. One such restaurant is TravelsinTaste.com's favorite Japanese spot, a unique treasure called Sasabune. 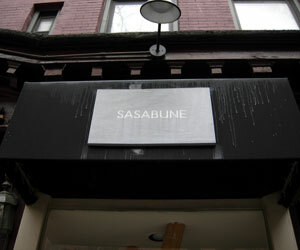 Nestled off of First Avenue on the Upper East Side, Sasabune is home to Chef Kenji Takahashi, who prepares his special form of Omakase six nights a week -- and five days a week, for lunch -- for salivating sushi- and sashimi-hungry New Yorkers who have grown addicted to his warm rice and exceptionally fresh fish. We recently had the chance to chat with Chef Takahashi about his philosophy, his reasons for opening Sasabune on the east coast, and his favorite fish, as well as its purveyors. We started our conversation talking about Chef Takahashi's roots. "I learned from my mentor, Nobi Kushuhara of Sasabune Los Angeles," he told us. "He taught me that the most important thing about food was the material; you need to use the freshest material." Chef Takahashi truly took that lesson to heart, as he loves fresh produce and adores fresh fish. As a matter of fact, he loves them so much that he makes a trip to the Hunts Point Market in the Bronx -- the world's largest food distribution center -- every morning at 5:30 a.m. in order to pick the absolute freshest ingredients for his Omakase menu. "I've been going to the Hunts Point Market every morning since I've arrived in New York," Chef Takahashi says. "I check for the best seafood each day. They know me."